Great show - audio and video were good. The musicians are first-class. I hope the keep playing on CW. I enjoyed the show even though I'm not especially a fan of Celtic music. Great Show. Wonderfully talented young musicians.. Solid musicians playing interesting and meaningful music. Great stuff! 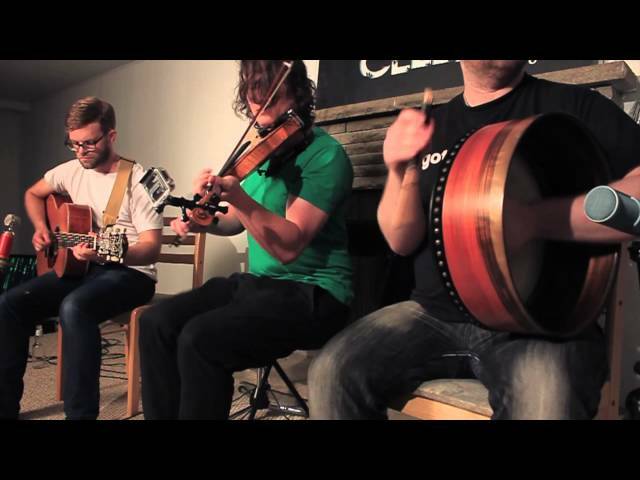 NUA is an innovative new trad trio, bringing a fresh and unique sound to traditional music, creating their own distinctive original compositions, balanced with traditional and contemporary tunes drawn from Irish and Scottish traditions. Based in Toronto, Canada, NUA consists of three award-winning members: fiddle player James Law, guitarist Graeme McGillivray and bodhrán player Jacob McCauley. The interaction between the three is what really makes the music shine, whether it be their soaring melodies or tasteful grooves. The original tune-writing of NUA gives their music its groundbreaking, adventurous quality, as demonstrated on their debut album BOLD. Bordering on progressive, while hinting at the traditions of the past, NUA’s compositions will take you on an exhilarating journey, creating an atmosphere and mood unique to the listener. The trio is also well known for their exciting incorporation of odd time signatures and polyrhythms, which give the music an electrifying lift and spontaneity. "Inventiveness abounds and the interwoven nature of some of the arrangements is impressively daring. They challenge you with an album that is creative, questioning, and inventive in equal proportions." (Tony Lawless of TradConnect) Each member adds his own distinctive sound and influence to the music. Although NUA is a trio with a sole melody player, the brilliant multi-tasking of each member is demonstrated countless times with perhaps a guitar-driven flat-picked melody, rhythmic fiddle playing, or melodic bodhrán playing to add to the mix. The ability for each member to take on multiple roles is one of the staples of NUA. This adds to a thrilling live experience, and a “you just don’t know what’s coming next” approach! "Bold is a thoroughly enjoyable album that leaves you almost drooling at the thought of how much fun these guys must summon up in a live setting." (Mike Wilson of Because Music Matters). NUA released their debut album BOLD on October 14th 2013 and are currently preparing for several tours in 2014.